#MWC15 NFV Demo: Back by Popular Demand. “Our next Barcelona event will be the 2016 Mobile World Congress, 22-25 February 2016, at Fira Gran Via […] Surpassing all projections, GSMA Mobile World Congress, the world’s biggest and most influential mobile event, had a record-breaking 93,000+ attendees from 200 countries. Hosted in the Mobile World Capital Barcelona for the 10th year, Mobile World Congress 2015 attendees were treated to a wealth of learning and networking opportunities; product showcases and announcements; inspiration and innovation.” – 2015 Event Highlights by GSMA. “As things begin to virtualize understanding operations become more critical. This is basically what ties everything together […] One of our most popular demos this week was a solution that featured an application centered system providing a ‘birds eye view’ of Network Functions Virtualization (NFV) while integrating dedicated screens for Operations and Support Systems (OSS), NFV’s Management and Orchestration (MANO) as well as Software Defined Networking (SDN) and Bell Labs’ Analytics… our entire NFV and SDN portfolio (Motive Dynamic Operations, CloudBand Management System and Cloud Nodes, Nuage Networks, vRAN, vEPC, vIMS) and research findings from Bell Labs rolled into what was affectionately known on the booth as the ‘mother of all NFV demos’ – Mobile World Congress Day 3 by Wendy Zajack. I am now back in surprisingly warm and sunny Chicago. We just left another pretty cold winter behind. Barcelona’s #MWC15 was very good to our team: the ‘Mother of All NFV Demos’ impressed everyone and we were challenged to look into a couple of additional use cases as a result. This demo ran well beyond 200 times. At the time of writing this: blogging about it has delivered 1,4K+ views already, Twitter’s analytics show 12,6K impressions and there are 210+ views for Flickr’s photo album. Let’s bear in mind that NFV happens to be [a] an emerging market segment based on [b] a set of technologies concerning the telecommunications sector only. Moreover, focusing on [c] operations could have risked being perceived as fairly dry, complex and obscure. The more reason for us to design a live, engaging and interactive demonstration experience. Besides, in this context, running 200+ live demonstrations on demand in just four intensive days with social media activity registering in excess of 14K impressions to date qualifies as a success story . We broke things down into two sections and, by the way, we used neither slideware nor video clips: our live demo had to purposely speak by itself. The first section was about ‘state of the art’ illustrated by Alcatel-Lucent’s current production environment, see above outline. That comprised 80% of content and dominated the conversation at the demo station. The remaining section exposed research findings, these being about ‘art of the possible’ and ‘future direction’ as outlined below. Once again, thanks to everyone contributing to this project as well as those providing feedback all along. This NFV Portfolio demo is now battle tested and back by popular demand. 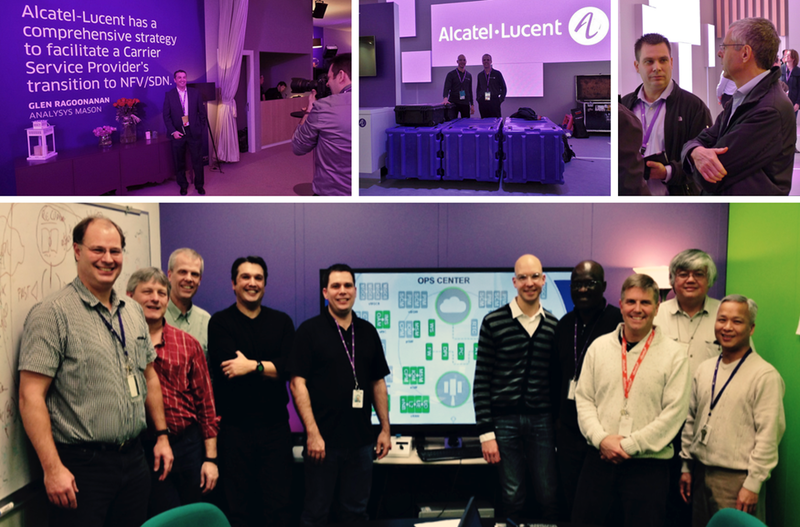 This means showcasing this at more industry events, Alcatel-Lucent’s own Executive Briefing Centers (EBC), and the Cloud Innovation Center (CIC). The underlying system was engineered to become a demonstration platform so that we can now explore and add more use cases, evolving the demo over the year. Click above to see the demo’s photo album.